Cells in our body can proliferate and survive only when they have suitable substrates to which they attach. Without having such substrates, they are destined to die by themselves through activating a built-in signaling program known as “apoptosis”. The anchorage dependence of cell proliferation and survival is one of the fundamental properties that govern multicellular organisms. 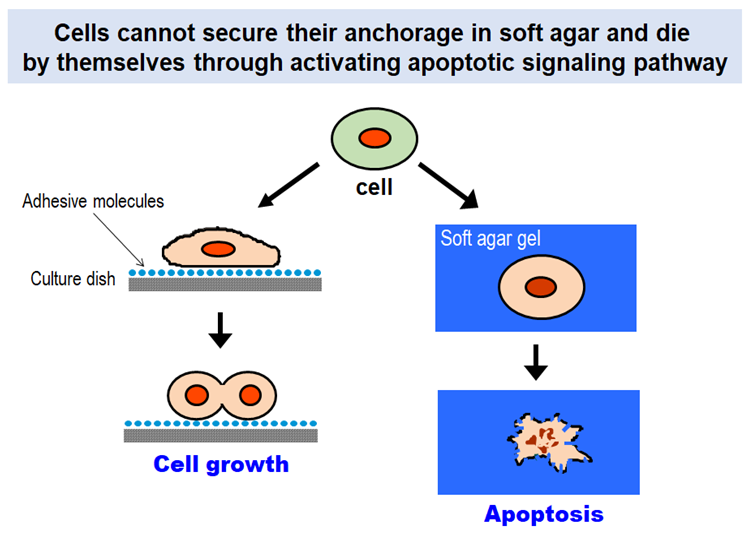 Why can’t cells proliferate if they do not anchor to their surrounding environment? Extracellular matrix (ECM) is the key to solving this long-standing question. Cells in our body express a group of proteins on their surface that bind ECM proteins and mediate adhesion of cells to the surrounding ECM. The cell surface proteins called “integrins” activate the signaling pathways that promote cell proliferation and suppress apoptotic cell death upon binding to their ECM ligands. Signals that sustain cell survival and initiate cell proliferation are elicited by a synergistic action of growth factors and ECM proteins. Stimulation with growth factors without anchorage to ECM is not sufficient for cells to drive cell cycle progression. Anchorage of cells with their surrounding ECM through integrins activates the MEK/MAPK and PI3K/Akt pathways for cell proliferation and survival and promotes cytoskeletal reorganization through activation of Rho family small GTPases. In this respect, ECM is regarded as another kind of growth factors insolubilized around cells. There are two kinds of ECM in our body: one is ‘interstitial matrix’ that surrounds cells in the connective tissue and another is ‘basement membrane’ that is a sheet-like ECM underlying epithelial cells. 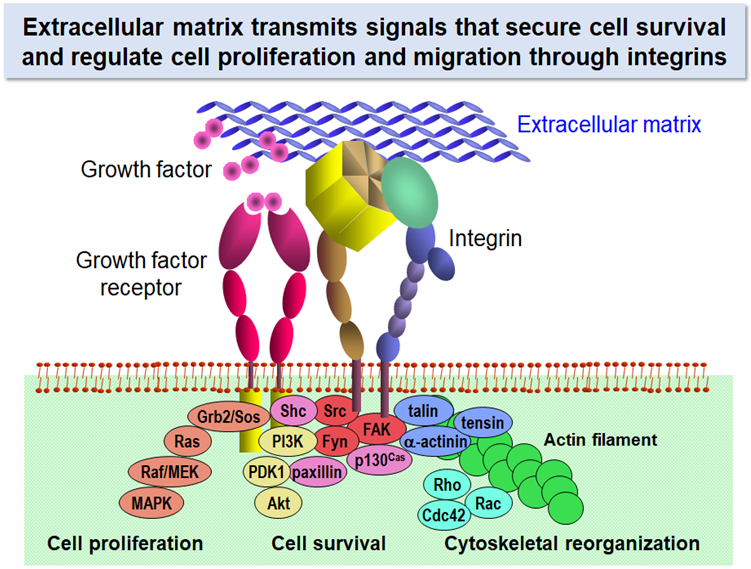 The interstitial matrix, particularly its major constituents collagens, has been the major theme in ECM research for decades. However, it is the basement membrane, but not the interstitial matrix, that serves as the substrates for many cell types. Parenchymal cells in many organs including kidneys, lungs, pancreas, liver, heart, and blood vessels use the basement membrane as their adhesive substrates and receive the signals that secure their functions, prevent apoptosis, and regulate their cell cycle progression through integrins on their cell surface. Basement membranes are composed of about fifty kinds of proteins. Some of these proteins are constitutive, i.e., expressed ubiquitously in the basement membrane irrespective of cell types, while others are expressed in more restricted cell types. 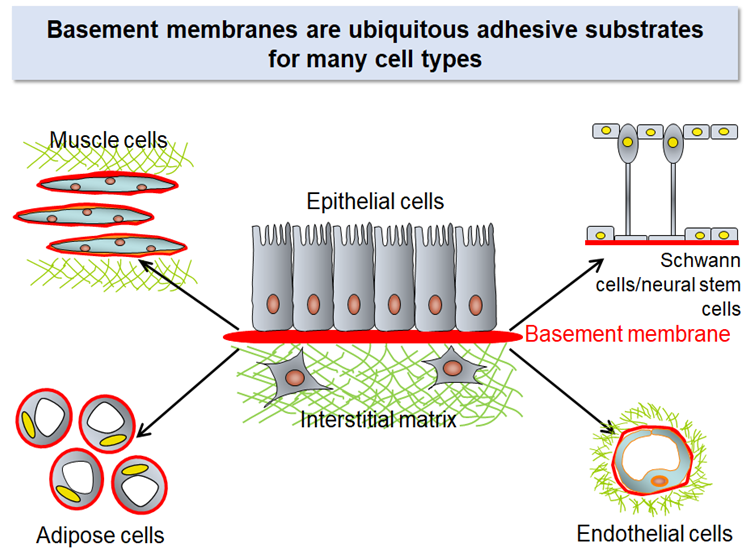 Hence, the composition of the basement membrane differs from one cell type to another*. *Refer to “Mouse Basement Membrane Bodymap”, an image database of the immunohistochemical localization of basement membrane proteins in mouse embryos. 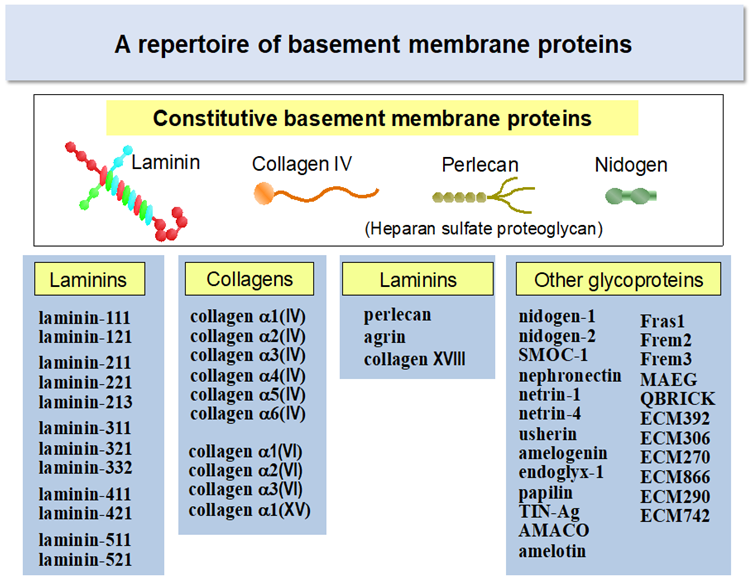 Laminins, nidogens, collagen IV, and perlecan are among those expressed constitutively in the basement membrane of almost all cell types. The genes encoding these proteins are conserved throughout metazoans. Among these proteins, laminins are the major cell-adhesive proteins of the basement membrane. 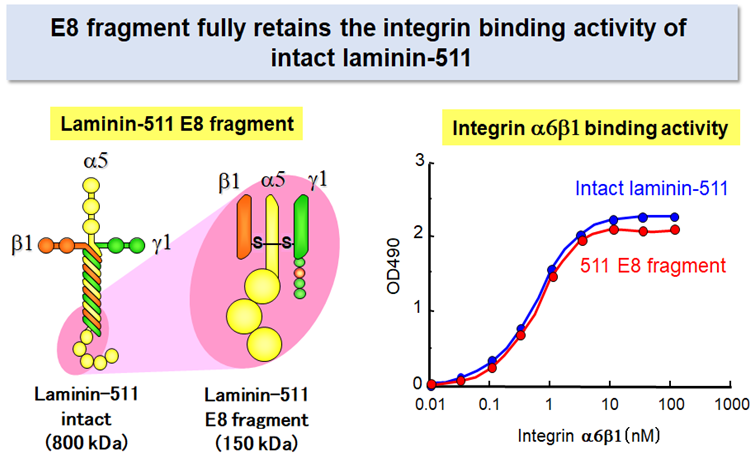 Cells express a panel of integrins that specifically bind to laminins, namely, integrin α3β1, α6β1, α6β4, and α7β1. Integrin-dependent adhesive interactions of cells with laminins transmit the signals that prevent apoptosis and regulate cell proliferation and differentiation. Laminins are heterotrimeric proteins comprising three chains called α, β, and γ. Laminins are one of the largest basement membrane proteins, having the molecular weight of 800,000 (400,000 for α chain and 200,000 for β and γ chains). 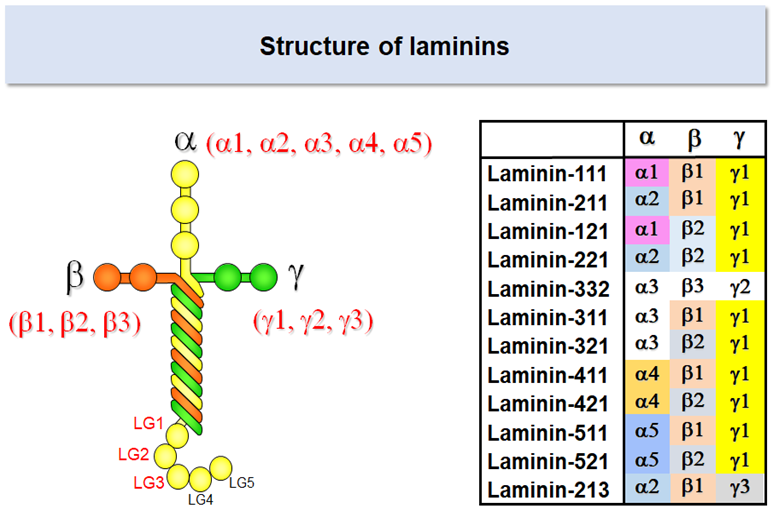 There are five α chains (α1-5), and three β (β1-3) and γ (γ1-3) chains in human, which together give rise to at least 12 laminin isoforms with distinct chain composition. *For more information on the customized usage of laminin α chains, please refer to the image database Mouse Basement Membrane Bodymap . 1 Ido H, et al. (2004) J Biol Chem 279:10946-10954. 2 Ido H, et al. (2007) J Biol Chem 282:11144-11154. 3 Taniguchi Y, et al. (2009) J Biol Chem 284:7820-7831. 4 Taniguchi Y. et al. (2017) Biochem Biophys Res Commun 487:525-531. Laminin isoforms are referred to with three digit numbers that represent their chain composition. Laminin-511 refers to the isoform consisting of α5, β1, and γ1 chains; likewise laminin-111 consists of α1, β1, and γ1 chains, and laminin-332 consists of α3, β3, and γ2 chains. The α5 chain, though the last a chain to be identified, is the prototype of a chains and expressed predominantly in early embryos and functions as the major adhesive substrates for epiblasts, the pluripotent stem cells that give rise to ectoderm, mesoderm, and endoderm. 5 Miyazaki T, et al. (2008) Biochem Biophys Res Commun 375:27-32. 6 Rodin S, et al. (2010) Nat Biotech 328:611-615. 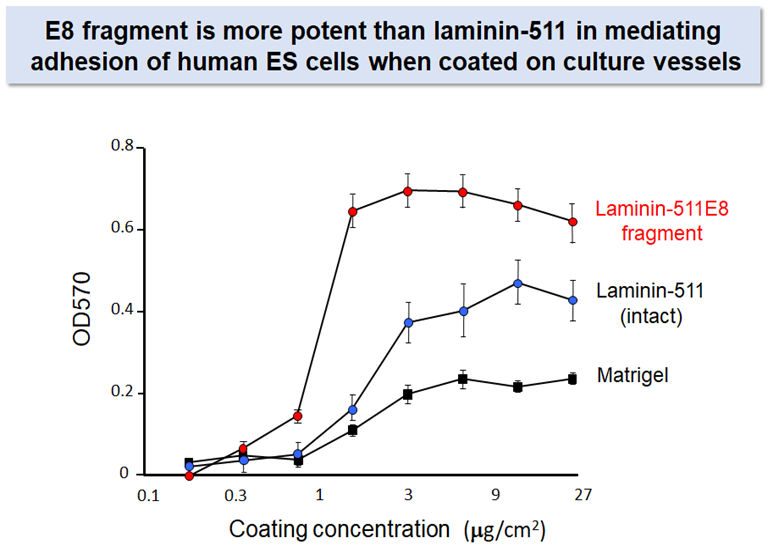 Despite its advantage over other adhesive proteins as the substrate for culturing pluripotent stem cells, laminin-511 is not suitable for large-scale production of its recombinant protein because of its large molecular weight and heterotrimeric nature. 7 Miyazaki T, et al. (2012) Nature commun 3:1236. 8 Nakagawa M, et al. (2014) Scientific reports 4:3594. 9 Doi D, et al. (2014) Stem Cell Reports 2:337-350. 10 Hayashi R, et al. (2016) Nature 531:376-380.